Sharon sent this picture of Blu, adopted in March 2007, and writes, "If you watch real close you will see the joy in your new angel's eyes as they jump after a favorite toy, which, for Blu, is just a plastic bag on a string. I do not even have enough words to describe how he came alive just after being here a few days. He talks and follows me around and sleeps on the end of my bed It is incredible having him here." 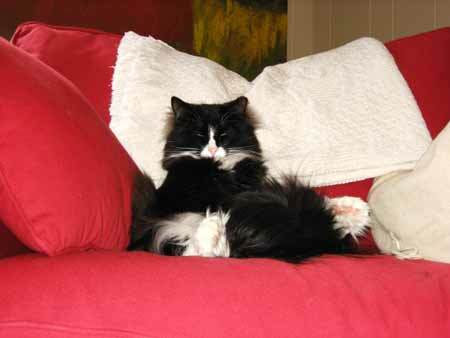 Diane and John write, "As you can see, Larry is quite comfortable here and we absolutely adore him! Thank you so much for rescuing him!" Update from August 2014: "We are sad to say that we lost our beloved Larry on August 2, 2014 after a battle with cancer that he couldn't win. We miss him dearly but are so grateful to Kitty Angels for allowing us the opportunity to love him and to be loved by him for these past (almost) eight years. RIP our big little guy..."
Annie writes, "Catherine (top) and Joseph (bottom) are thrilled in their new home! They play together and sleep together. They certainly couldn't be any happier!" Sammy was adopted by Katherine and Marco in mid-2006. 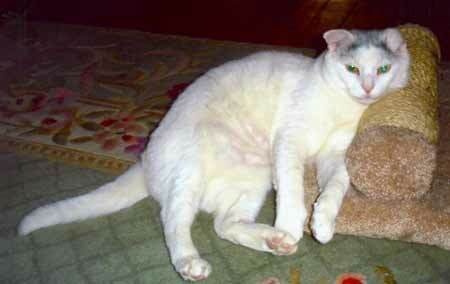 They write, "Sammy has fit right in with his favorite buddy, our dog Sagey as well as two other kitties. His personality has really blossomed and he is such an outgoing and loveable little guy, a real accomplishment for a kitty with a feral background! Thank you so much for rescuing Sammy and bringing him to us!" 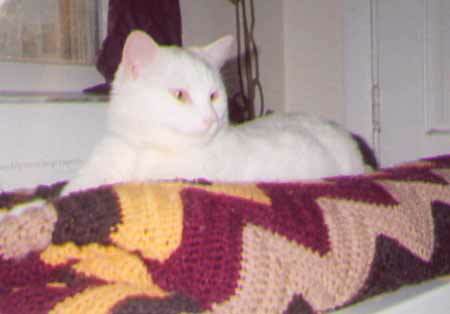 Janie writes, "Early in 2007 I decided to take a little trip to Kitty Angels to see if I found a kitten/cat that needed me or vice/versa. "I went to pat Karmell and she was so shy, and Jizzy just seemed to pop up so we took Jizzy behind the cages and at first she was a bit nervous but then we began to bond and did we ever! "I knew she came from a feral community but I was undeterred as many people have these little gems so misunderstood. After awhile, my heart said...Jizzy is coming home and she will have three brothers waiting for her, one that I did adopt from Kitty Angels previously--Taylor J. Livingsworth. "I brought her home, set her up in my bathroom with all the comforts of a mini motel. A bed, a cat tree, toys, food, water, and a potty box. And of course she could not spend the first night alone so I took to sleeping on the floor of Jizzy's makeshift motel to let her know she belonged beyond the doors. Her brothers kept poking their paws underneath to meet and greet her and by morning she was sleeping next to my legs. "To make a short but long story short within five days she was romping with her brothers and intently watching them as to find out how to play, interact and love in a family. She learned very quickly she was not alone anymore and would be loved unconditionally by me and her new brothers. Jizzy's favorite toy became marbles!! "That made me think! What DID I DO!!! I needed to take home her sister KARMELL!!! Jizzy needed her sister!!! I immediately called Helen and prayed that she would tell me Karmell was still available and I was beyond jumping for the moon when Helen said she was. I made arrangements with Helen to get Karmell ASAP. 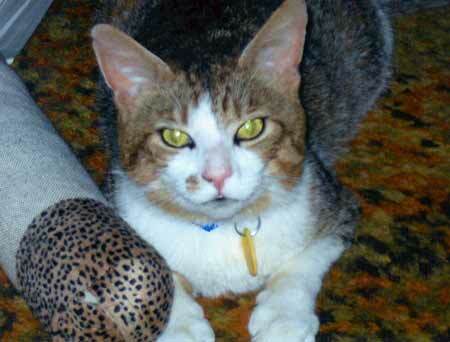 "When I brought Karmell home, now to her sister and three brothers, she was different than her sister but, FANTASTIC! In three days she was out and about and her full name became KARMELL O' KUDDLES as she is such a cuddle bug one would NEVER know these were to have come from a ferrell community. To sum everything up, they both love their new home with me and their three brothers. They love toys, Jizzy walks on two legs!!!! And believe it or not, so does Karmell. They throw their toys in the air on two legs, carry their long fishing poles upstairs and down, I always hear marbles rolling and again, All my babies, Thaddeus Tadpole, Zigzag Pollywog, Taylor J. Livingsworth (Kitty Angel adoptee), Jizzy O' Tizzy and Karmell O'Kuddles have made my life one big adventure and full of love. Jizzy and Karmell even feel comfortable enough to join me in bed for the night with their brothers! Glad I have a king size mattress and a few kitty beds lying around the corners if they feel like a more comfortable place alone on my bed. "I give much admiration for Kitty Angels for bringing these little angels in and allowing me to adopt them into my home and heart." 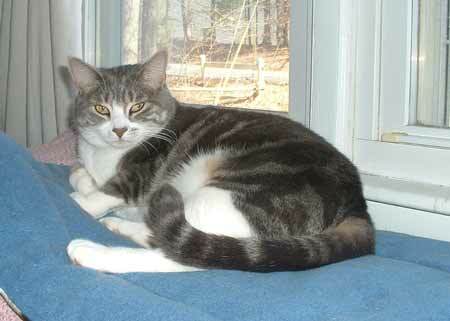 Candy writes, "As you can see, Trevor is a beautiful kitty and undeniably an angel! He was adopted in May 2007 and was about a year old at the time. We bonded the very first night and it has been a love match ever since. 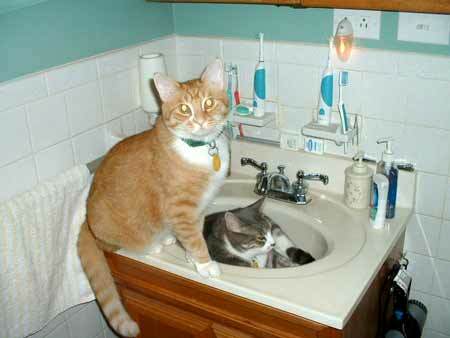 "He likes to follow me from room to room, and keep me company when I shower and brush my teeth. He is without a doubt a real blessing in my life, and I encourage anyone who is thinking about adopting a kitty to do so, as it will really 'light up your life'."